It can be argued that the little 166, Ferrari’s seminal early 1950s sports racing car, is the most important model in the marque’s 70 year history. While there been faster, sleeker, more exotic Ferraris that have conquered the great races of the world, it is the tiny, jewel-like 166 that truly marked the intersection of Scuderia Ferrari the race team and Ferrari the constructor. Ferrari 166 drivers such as Eugenio Castellotti, Luigi Chinetti, Alberto Ascari and Clementi Biondetti put Ferrari on the map as a world-class constructor of race-winning cars that could be bought by privateers. The 166 was the first Ferrari to win at the Mille Miglia with Biondetti in a 166 S (the MM moniker following to commemorate that momentous win). Biondetti repeated that feat a year later, while wins at Silverstone, the Targa Florio and countless other events soon came pouring in. In 1949, a 166 MM Barchetta was the first Ferrari to score an outright victory at LeMans after an heroic effort by Chinetti and just two weeks later, a 166 won the 24 hour race at Spa Francorchamps. Luigi Chinetti’s move to the United States and his establishment of Ferrari North America was a pivotal moment for Ferrari and the 166 MM. The burgeoning road racing scene in the USA was gaining tremendous momentum, and wealthy car owners and drivers began purchasing “gently used” Ferrari sports racers such as the 166 MM at a feverish rate. It soon became clear that to win, you needed a Ferrari. So the 166 again proved itself as a landmark machine: The car that established Ferrari in the critical North American market. One might think that Ferrari employed a “power in numbers” technique to achieve such success, but in reality, a mere 46 examples of the gorgeous little 166 were built between 1948 and 1953, with those 46 cars going on to win a tremendous amount of races. As was typical for Ferrari, numerous coachbuilders applied their craft to the robust 166 chassis, including Stabilimenti Farina, Touring, and Zagato. These cars were tools for racing so they were often used hard and cast aside when a newer, faster machine was made available. Inevitably, some were crashed and rebuilt, blown up and fitted with new engines, or had other major assemblies replaced or upgraded as needed. As a result, a scant few survived wearing most or all of their original components intact. Our featured example is a highly desirable 166MM/53, wearing S/N 0300M, which was dispatched from the Ferrari works on April 1, 1953 wearing Vignale Berlinetta coachwork as per the build sheet. The 8th of just 13 Series II 166 MM’s produced, it was delivered via Garage Francorchamps to Jacques Herzet of Belgium who immediately set about competing in his lovely new acquisition. On May 17th of that year, Herzet competed in the Coupe des Spa, finishing second overall in is very first outing with the 166; no doubt a sign of things to come and hinting that his 166 MM had a particularly potent V12 under the bonnet. He enjoyed a tremendous run of success with the car, finishing on the podium in events such as the Coppa D’Oro, Rallye des Alpes, and a class win and 3rd overall on the grueling Liege Rome Liege rally. Herzet went on to finish second in the inaugural European Rally Championship in 1953; a remarkable achievement for a privateer entry. Herzet’s success was no doubt aided by his young co-driver, a then-18-year old Lucien Bianchi, who would himself go on to race in Formula 1, win the Tour de France Auto on multiple occasions, and win the 1968 Le Mans 24H overall in a Ford GT40. When the Belgian weather turned cold, Mr. Herzet shipped his beloved 166 to South America and continued to compete; enjoying many more top finishes in Brazil. But the rigors of sport had taken their toll on the fragile Vignale coachwork, so less than a year after taking delivery of 0300M, he returned it to Belgium, entrusting it in the hands of designer and coachbuilder Martial Oblin. The brief was simple – make the car look fresh, but also make it lighter and thus more competitive. Oblin created a stunning design in the “Barchetta” (little boat) style. Gently sloping front fenders gave way to cut down doors that are highlighted by beautiful curved haunches. Form follows function with a bulged hood scoop to feed the trio of Weber carburetors, and a simple cut-down Perspex screen runs the width of the cockpit, revealing at this car’s purpose as a road-rally competitor. The Oblin body was indeed lighter, making the 166 a good deal quicker as a result. 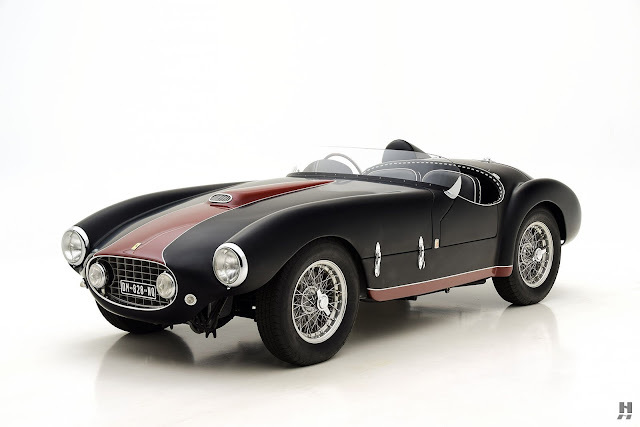 The completed car was shown at the 1955 Brussels Motor Show in a stunning and highly unusual matte charcoal color scheme, accented by a deep red stripe running down the center and along the rockers. This paint effect was very rare for the time and the car caused quite a stir, earning a place in the 1955 Ferrari Yearbook. Despite its show stopping appearance, Mr. Herzet returned to competition with 0300M in numerous venues across Europe. Successful runs continued through the end of his tenure with the car in 1957. Rather unusually for the time, the majority of 0300M’s competition achievements came with the same driver/co-driver combination almost from day one. In 1957 and following it’s truly remarkable time with Herzet, 166 MM 0300M was sold to Mr. Jean de Dobbeleer, a former Bugatti Agent for Belgium. He retained the car through 1966, and is credited for preserving it in its original condition at a time when used racing cars were considered throwaway items. From de Dobbeleer’s hands, it was sold to a Mr. Ed Bond of Connecticut, USA who cared for the car from 1966-1970 until passing it to Steve McGeary of Florida (1970-1975), and then on to Robert Cressman, also of Florida, who kept the car through 1977. All the while, the Oblin Ferrari was sympathetically kept in remarkably original condition; unmolested and mechanically unaltered from the time it was in the hands of its original owner. 0300M then found a most enthusiastic and caring owner in Robert Selz, who carefully restored the car and enjoyed it for the next 35 years, participating in many events including the Mille Miglia in 2005 and 2009. With a new owner in 2012 came a very careful and sympathetic restoration to Brussels Motor Show specification in the hands of Ferrari experts Charlie Webb and Kent Bain of Automotive Restorations, Inc. in Connecticut. Mr. Webb has been responsible many concours-winning Ferraris at venues such as Pebble Beach and Villa d’Este. During this time, 0300M was inspected and researched by Marcel Massini who found it to be in staggeringly original condition, particularly for a car with such an accomplished race history. It retains its original chassis, engine, gearbox, and rear axle, all of which are truly remarkable for a machine with such an extensive racing pedigree. Since the restoration was completed, the car was shown at the 2013 Cavallino Classic and the 2013 St. James Concours in London. In the hands of its most recent owner, 0300M was returned to Maranello where it was inspected by factory experts in Ferrari’s Classiche Department and awarded its “White Book” authentication, a specific category by Ferrari Classiche that provides the highest attestation for Ferraris of historical interest, such as those used for race or show purposes. During this process, Ferrari’s Classsiche Department discovered that aside from the major mechanical components previously verified by the Massini Report, the carburetors and ignition system were in fact found to be correct for 0300M. Build sheets indicated the car left the works fitted with a trio of Weber 36 IF4C carburetors, but notations were found that show the car was returned to the factory very soon after delivery to be fitted with improved 36DCF/3s as specified by Mr. Herzet; which it still wears to this day. At the same time, the S55A distributor was upgraded to an S55B-spec unit for racing purposes. This level of originality is unusual for any 64 year old automobile, but is truly remarkable for a car that has endured the type of competition use that 0300M has. Beyond its staggering race history, 0300M is one of just three known cars - and the only Ferrari - to have been bodied by Martial Oblin. It presents today in beautiful concours condition, fresh from the lawn at Pebble Beach and supplied with a full array of documentation, copies of period photographs and race history. The recent Classiche Certification has further confirmed and solidified its incredibly authentic presentation, and items such as the tool roll, quick-lift jack, and even a wooden tool box with service tools are included in the sale. The sale of this stunning and hugely important Ferrari 166 MM represents a very rare opportunity to acquire a genuine, early competition Ferrari with iron-clad provenance supported by the top names in the business, up to and including the Ferrari factory. History, provenance and style aside, 166 MM/53 0300M is a truly fabulous automobile to drive. The jewel-like 2-liter V12 engine is in top condition, having been sorted by the best experts in the world. With the ultra-light alloy coachwork by Oblin, and that potent engine, it returns exceptional performance. We can easily see how Jacques Herzet was smitten by his very special Ferrari from the first drive – and how he managed to achieve such incredible accomplishments in it as a privateer. 0300M remains eligible for virtually any event on the concours circuit, and with fabulous performance and easy road manners, it is the machine of choice for rallies and events including the Mille Miglia Storica. This is a remarkable opportunity to acquire one of the best examples of a most important model in Ferrari’s history, one just 46 cars built, and one that carries with it a truly incredible history.